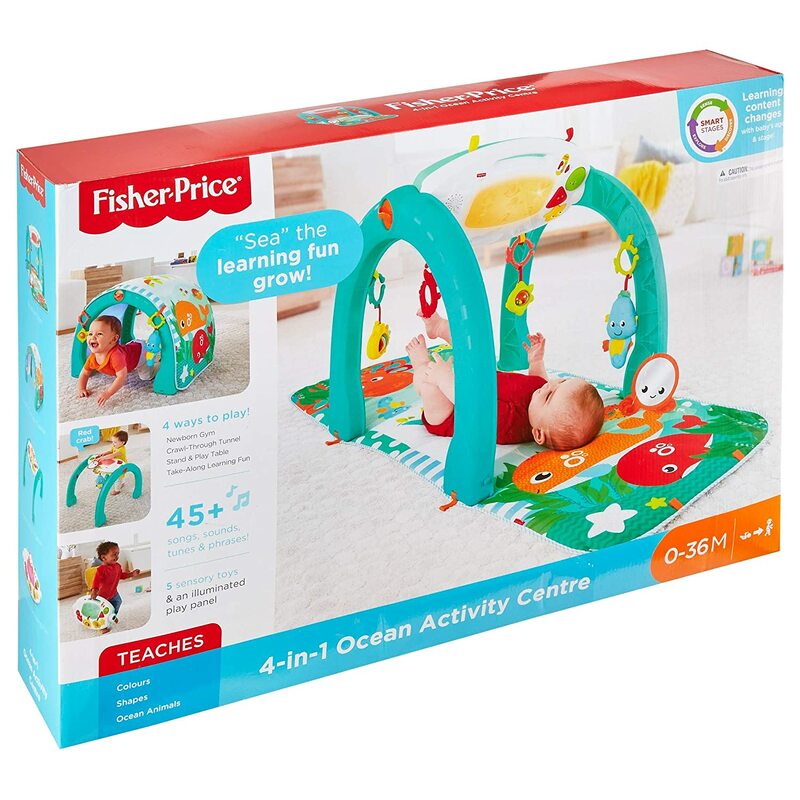 Your baby can dive into all kinds of aquatic adventures with this 4-in-1 transforming activity gym. 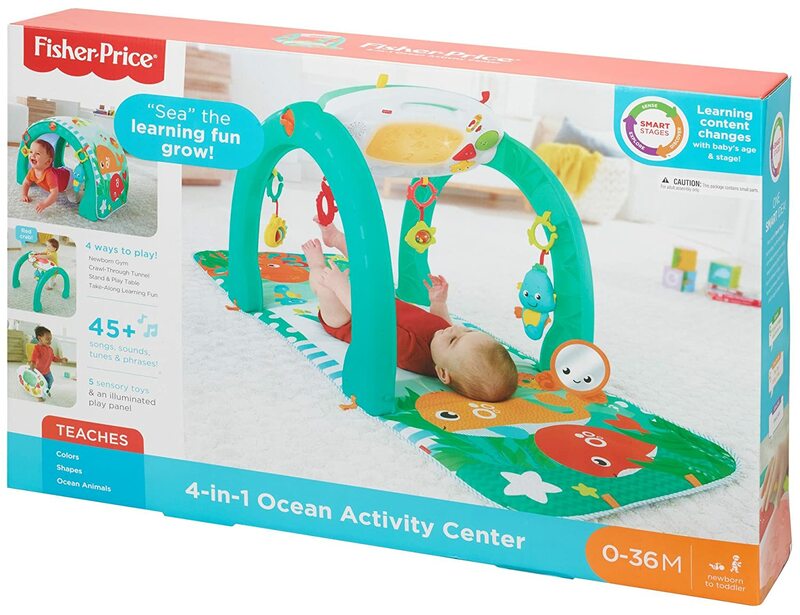 With its bright, extra-thick playmat, linkable sensory toys, and light-up activity panel with exciting songs, sounds, tunes and phrases, this ocean-themed activity center will keep your little seafarer playing and learning from newborn to toddler. 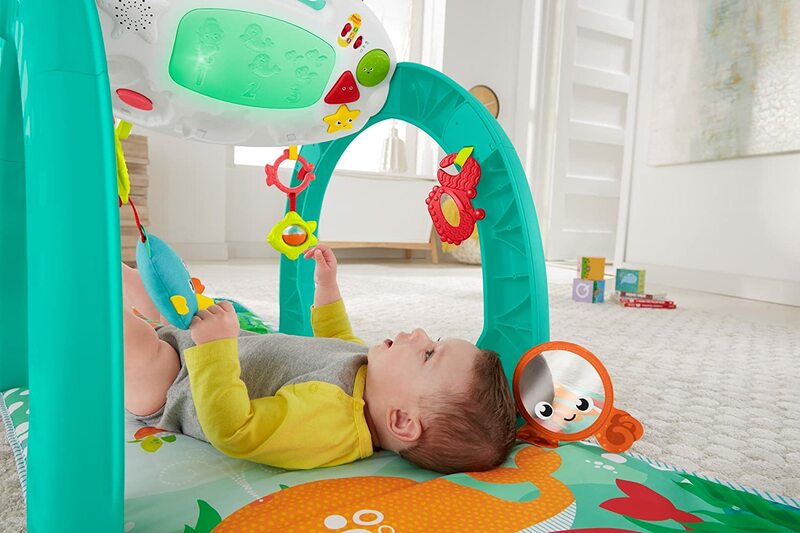 Where development comes into play; Sensory: The variety of bright colors, different textures, lights and sounds, excite and engage your baby's developing senses. 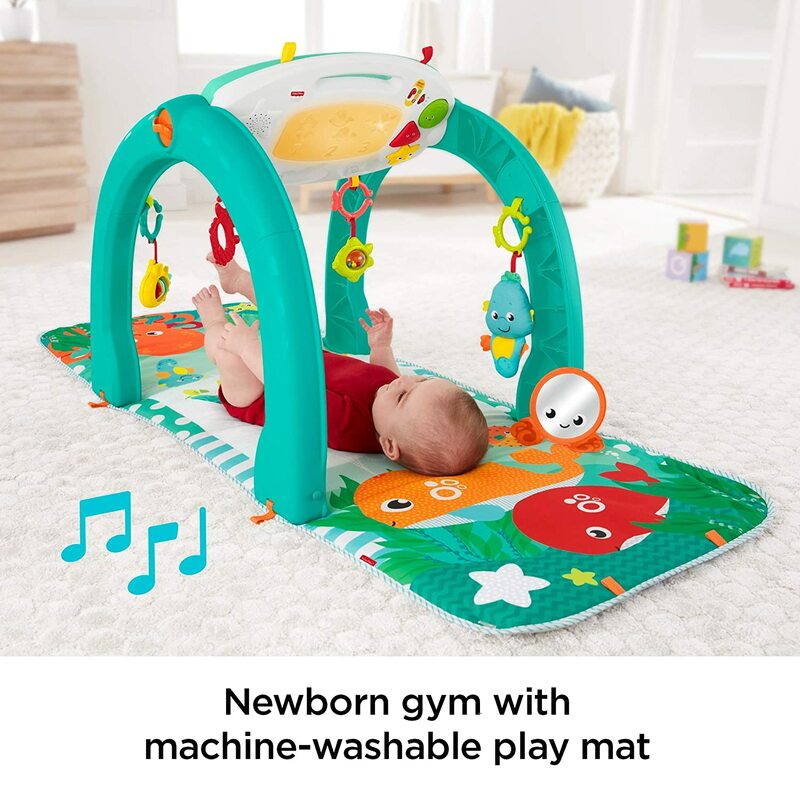 Gross Motor: Your little one's neck and core muscles will get a big workout as your baby pushes up during tummy time to interact with the toys. 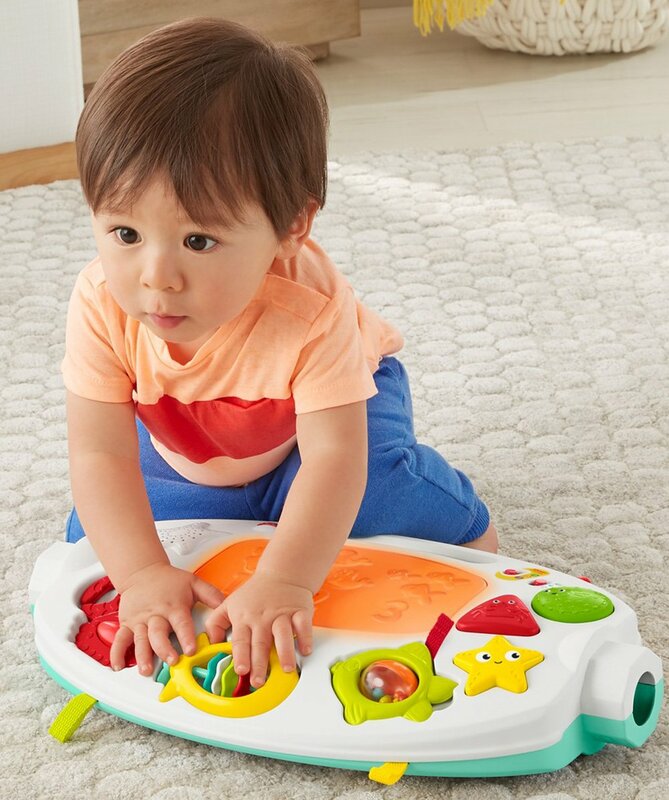 Curiosity & Wonder: Little seafarers are introduced to cause and effect as they discover that pressing the buttons on the activity panel activates fun songs, sounds, tunes and phrases. I have had this a while now..I needed the grandsons to come by for me to get their review on it...After all, all of these things look like something I would have love to have had when I was a kid...(I truly don't remember them). 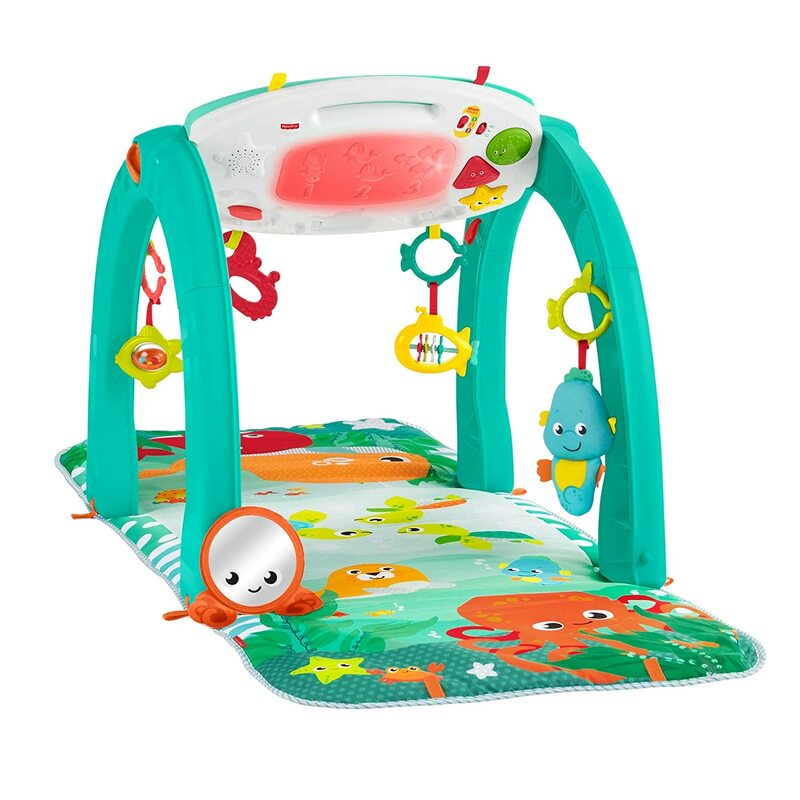 An all new experience for me..Once we got them here and set it up it's been a thrill ride ever since...Like the others I have seen before this, this thing is wonderfully thought out as to something as simple as a rattle to listening to the many sounds and songs, lights, etc,. that babies and youngin's will both run into while playing, and, will eventually get to remember and return too. This is rugged overall and there is not a sharp corner or small piece anywhere that can be broken off or dangerous..Bigger kids could roll and kick this around without any damage. It's made to not just entertain the true youngin's, but a survive a whole passel of kids. The range on my grand kids here doesn't see everything on it being offered used yet..But over time all of the benefits of this will come to be tested an enjoyed. For me personally, I love the way this can come apart and made into a tunnel. Or just taken apart for the individual pieces to be enjoyed. Everything on it is well designed for knowing it will have to be taken apart often for cleaning, and how the components can be stripped to make that job much easier...There is really nothing about this I have run into that I would call a negative, or con. It should last generations..Just a very well designed piece that comes at a fair price in my opinion.. The boys love it here, we all do too, and I highly recommend it.. 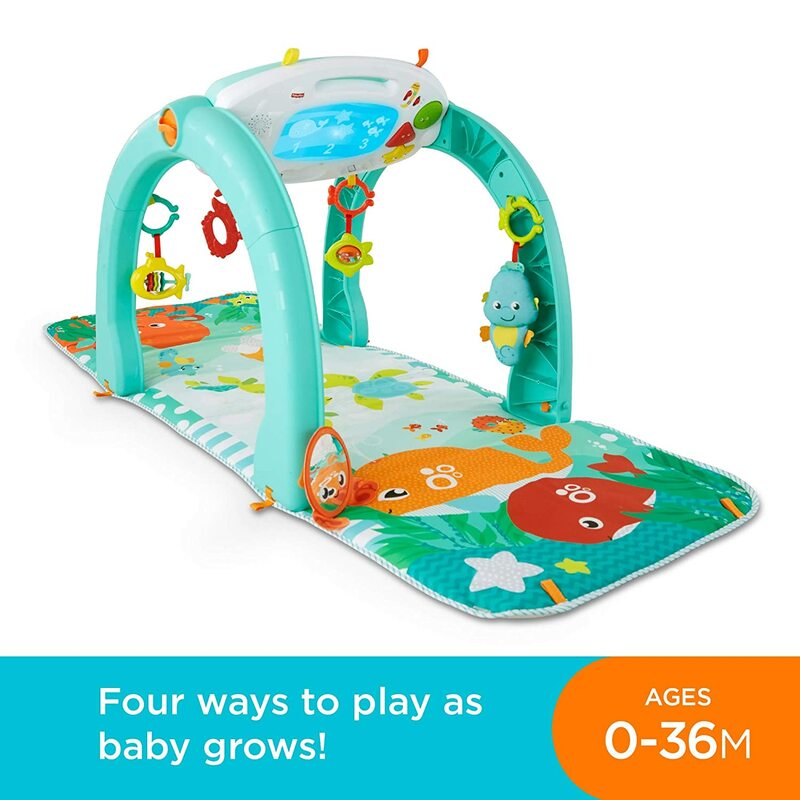 This activity center is something that will grow and change as your baby gets older. It will take you from newborn to toddler. 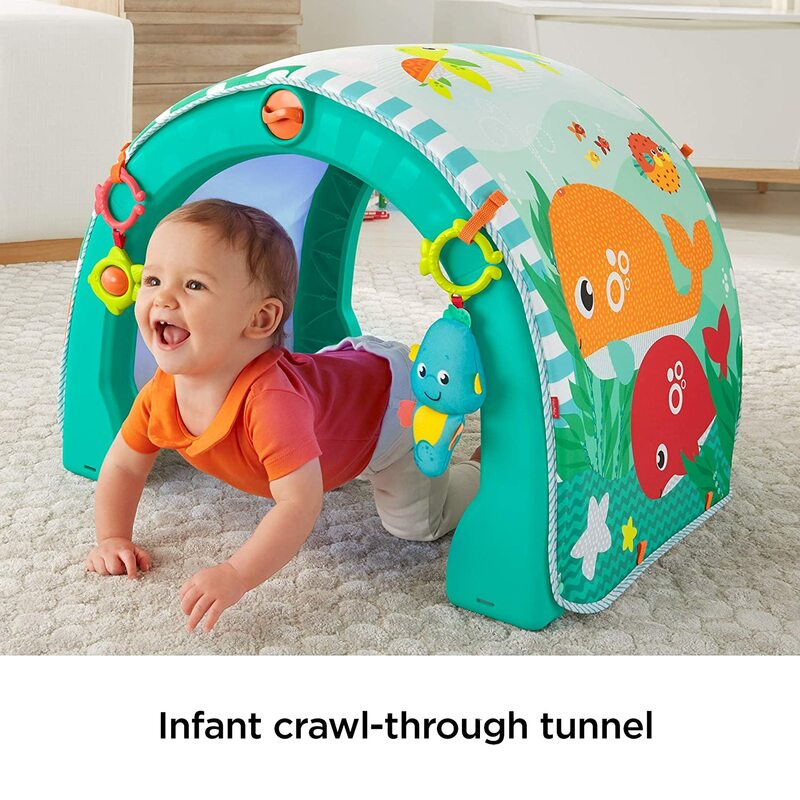 I particularly like that it goes from being a little activity gym for little babies to a fun tunnel that older babies can crawl through. 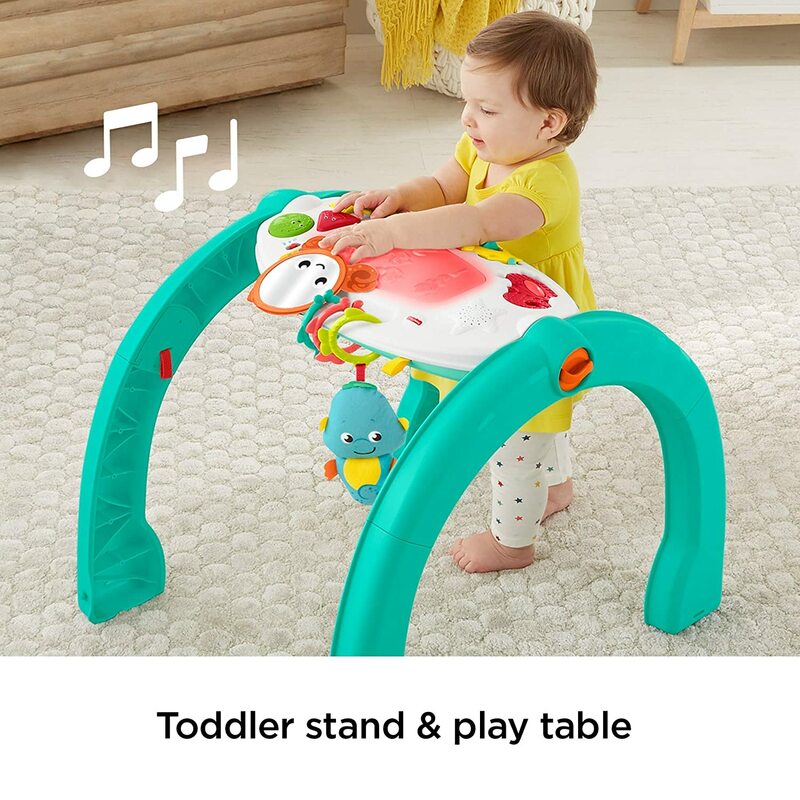 It also converts to being a fun little activity table when your little one can pull up to standing/cruising. 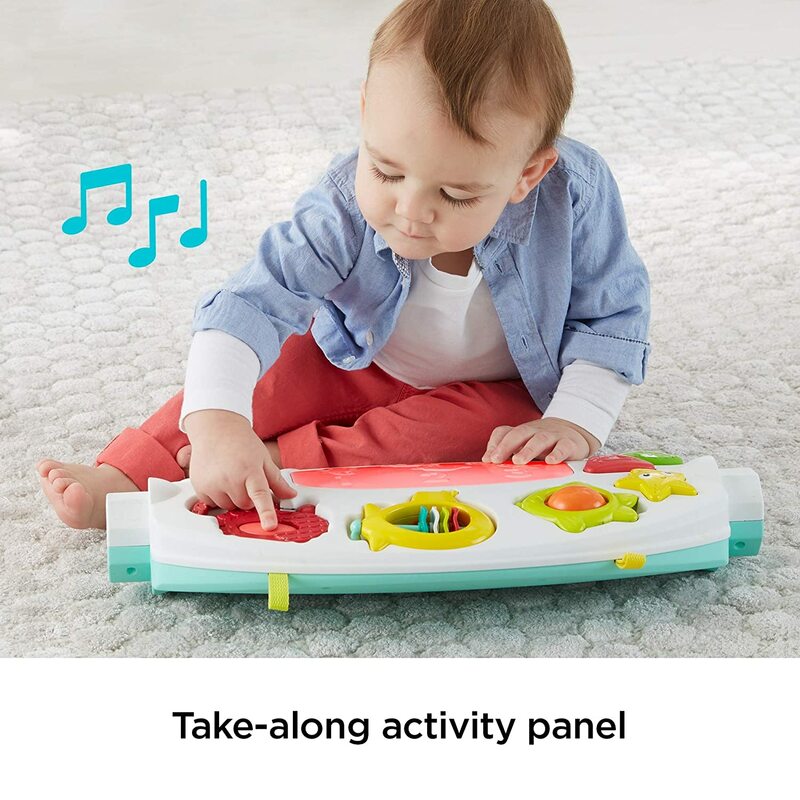 And the electronic unit can also be detached so your little one can sit on the floor to play with it, too. 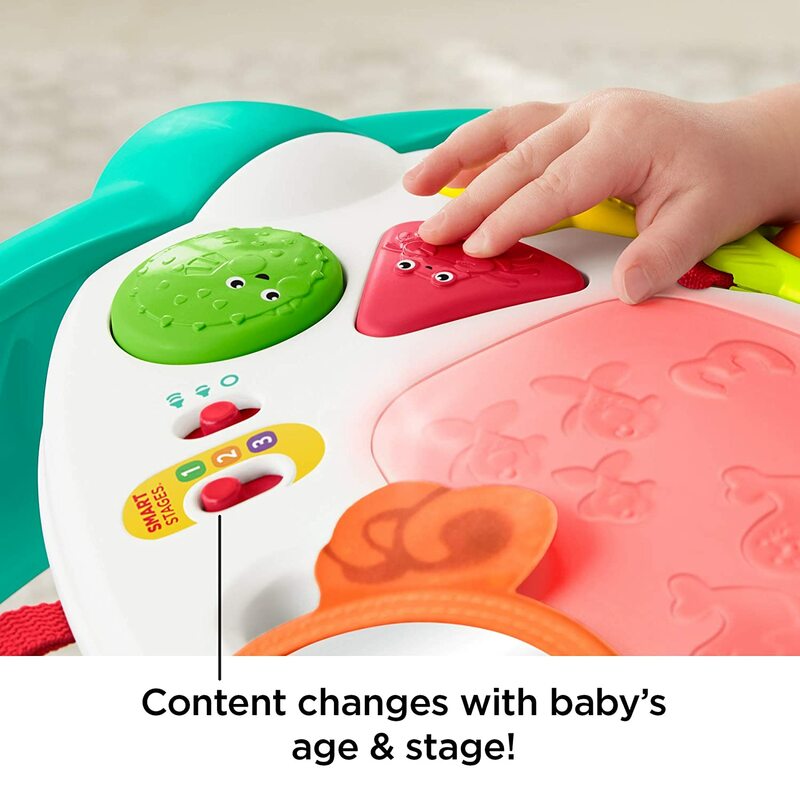 This toy offers plenty of versatility to get you through several stages of your baby's development. It's a good toy that will last you more than a few months. This is probably the best playmat ive come across so far. 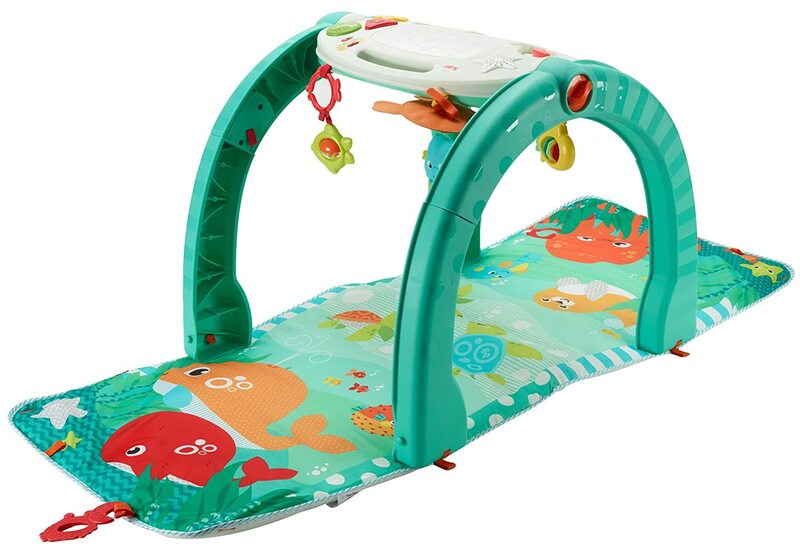 I have had many over the years and theres been a few that I really loved and lived how cute they were etc., but this one tops them all due to the fact that it can be used so much longer as the baby gets older, since it can be used so many different ways. The hanging toys are cute and fun to bat and grab at when younger and then play with separately when the baby is a little older. The mat itself is nice and long. 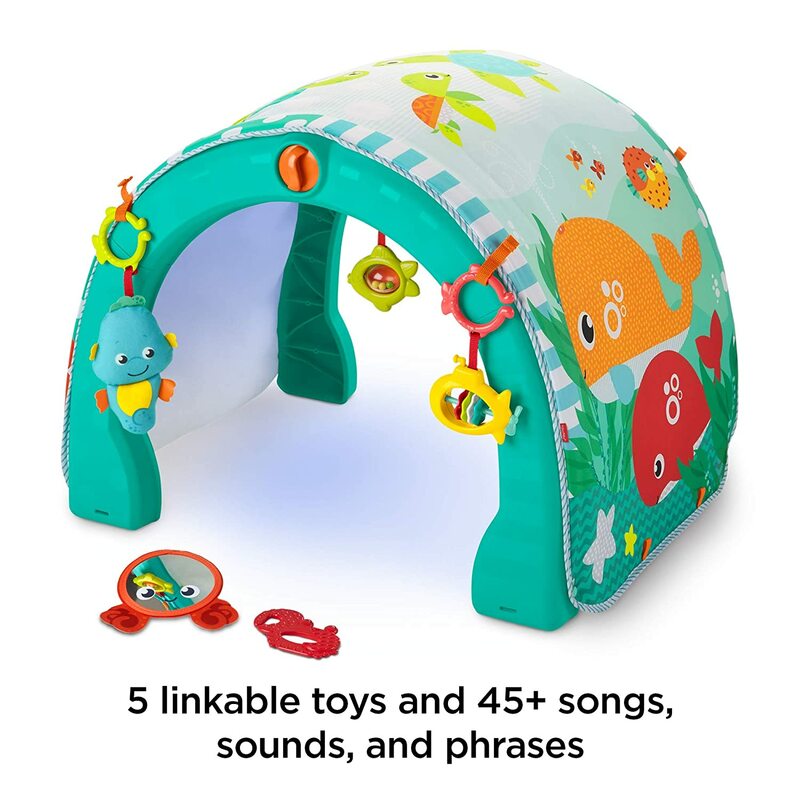 So many sounds, music etc to keep the baby entertained and occupied and advance along with the baby. This seems like the best value in playmats, for sure. My nieces are 3yo and a baby, and both kids LOVED this activity center. 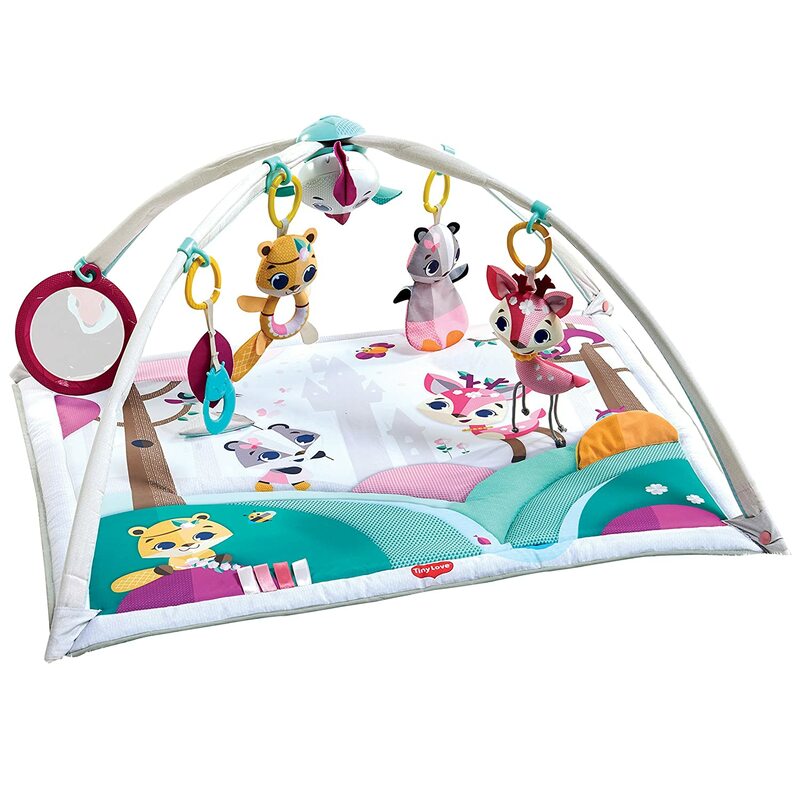 It's newborn gym, then a crawl-thru tunnel, stand-n-play table or a take-along learning fun. 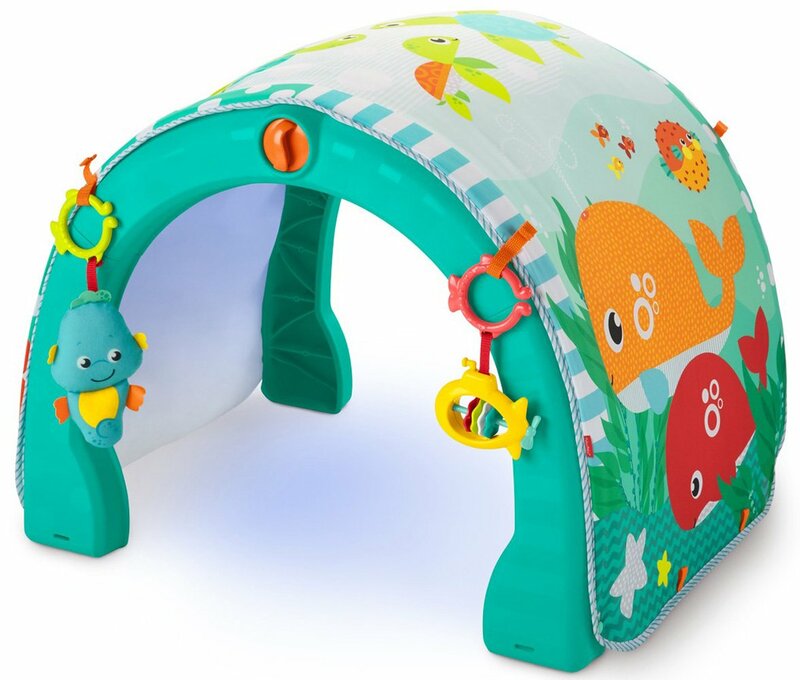 Most baby mats end their useful life once a child starts crawling, not so with this activity center. It's made of excellent quality and useful for years to come. 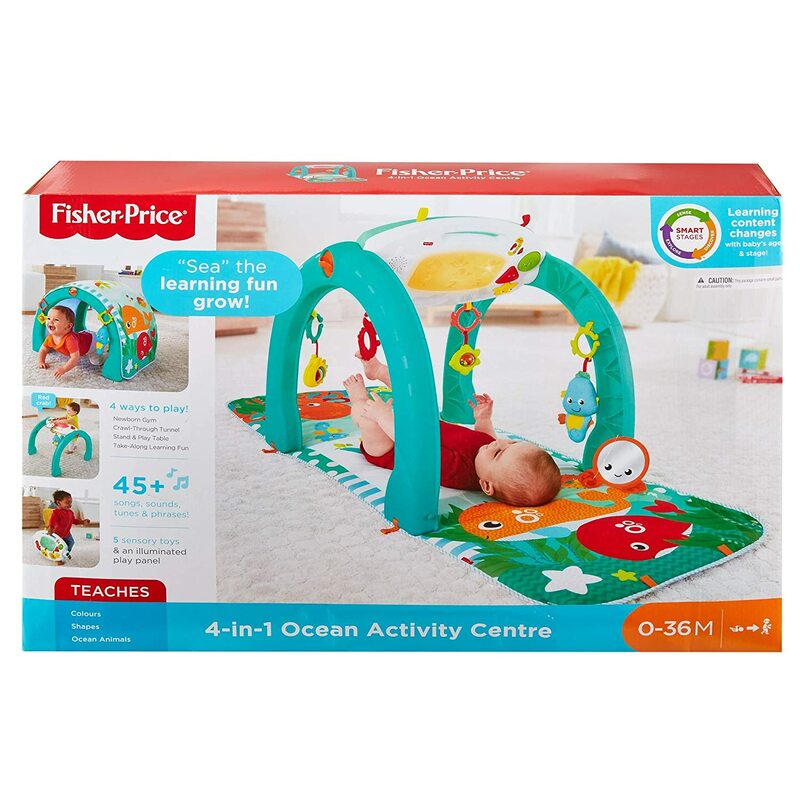 I love this 4 in 1 Activity gym for my baby. It keeps his interest as he rolls toss and turns. The parts are safe and wonu2019t harm the baby. Iu2019ve had other activity gyms but this one I like more. 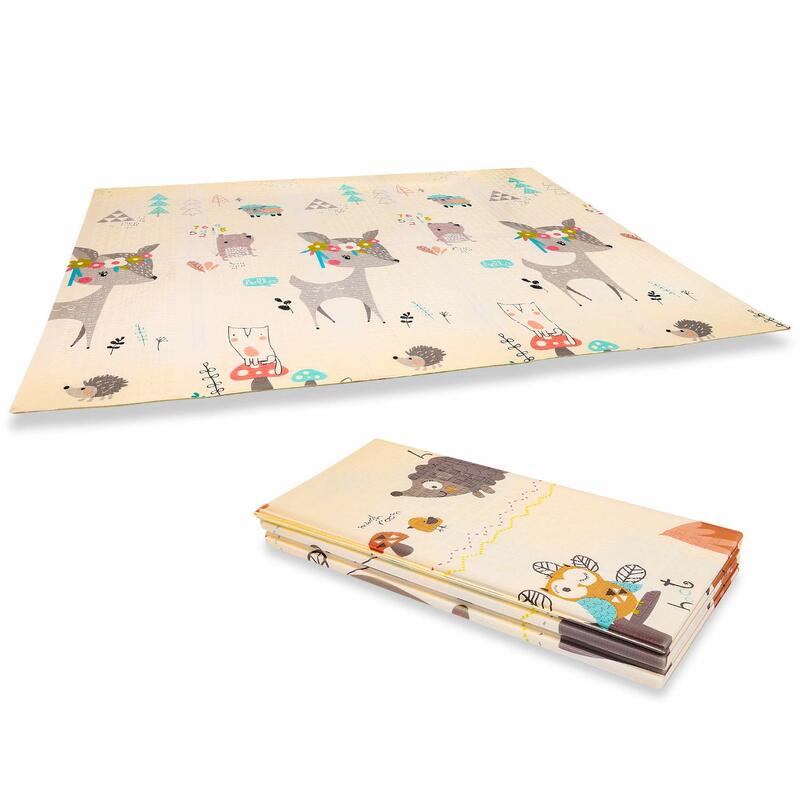 This is such a pretty play mat for small babies. They can get some exercise and work on focusing their eyes and reaching with hands. Would make a very nice baby shower gift. The kids are pumping out g-kids a couple time a year. The next one is due in November and will get this gift. Thank you reviewers for comments and pictures. Can't wait!